Many Tennessee fans want to see Phil Fulmer replaced, but unless something unexpected happens, the 57-year-old coach is in no rush to leave. "I'm committed for another eight to 10 years. At least," he told Bryan Mullen of the Tennessean. 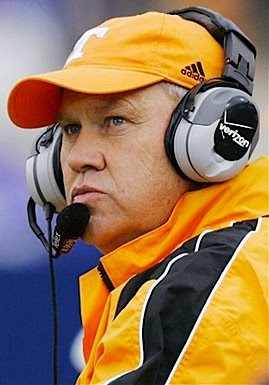 Why is Fulmer so confident about his future in Knoxville? Mullen reports that Fulmer is about to get a fat raise, pushing his salary between $2.6 and $3 million a season, up from his current salary of $2.05 million. And the extension could be for seven years. "It's never been about money; it's never been about fame," Fulmer said. "I just enjoy the job."